I set out this morning to ascend some Manor Donalds. 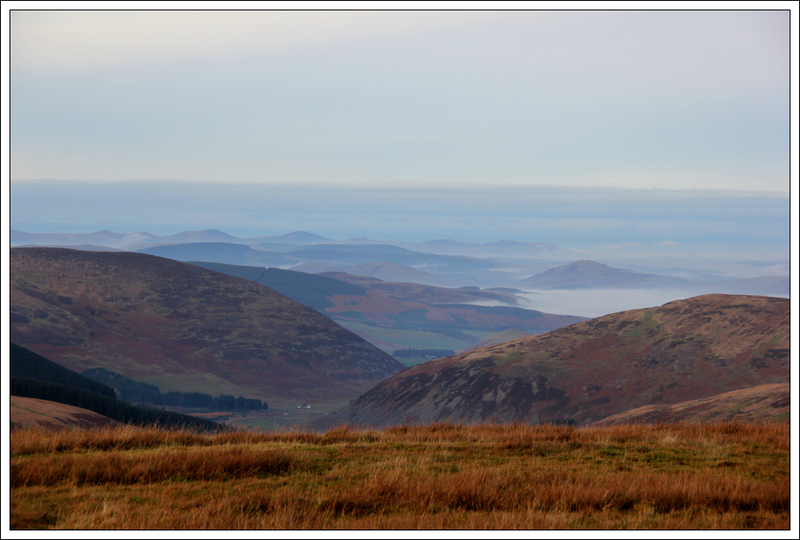 The drive from Peebles as far as Cappercleuch was through thick fog. I was hoping this was just a thin layer of inversion. On seeing glimpses of blue sky above the mist, I knew this was going to be a good day . 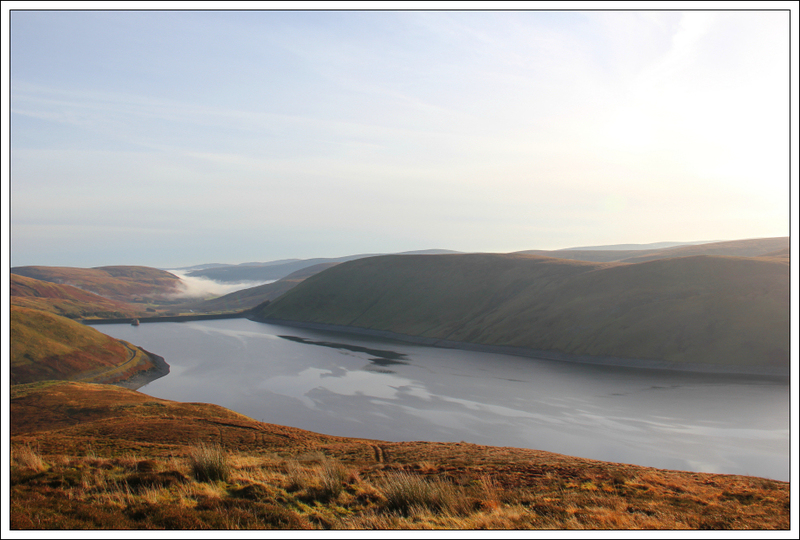 On reaching the Megget Reservoir, I parked in a small car park just below Cramalt where there is room for several cars. 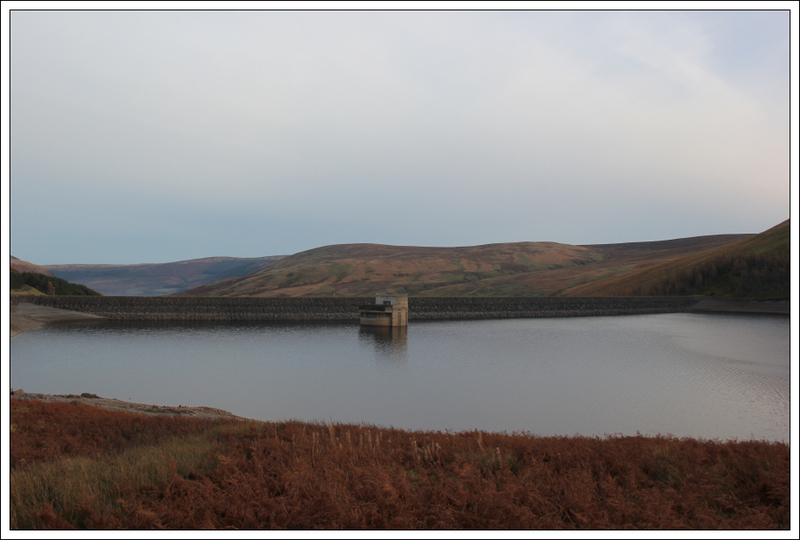 Before setting off walking, I took a photo of the Megget Reservoir dam. 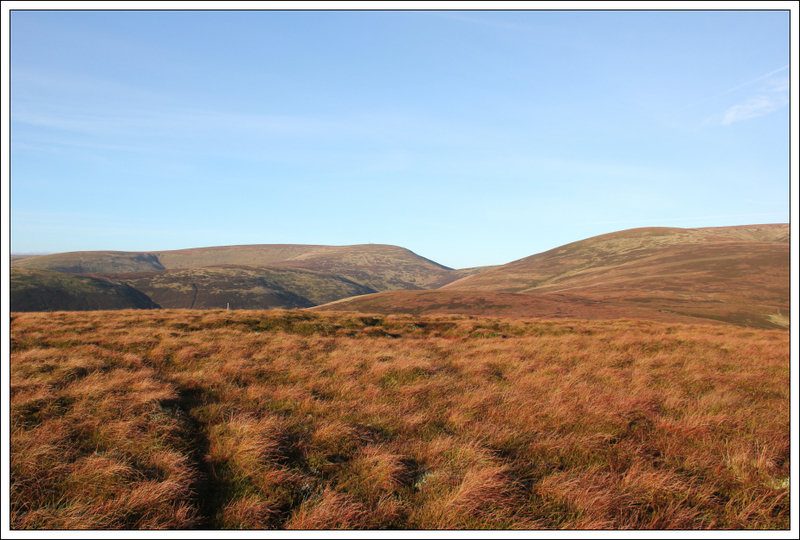 I decided to start off with an ascent of Clockmore and then see how far I could progress within available daylight. 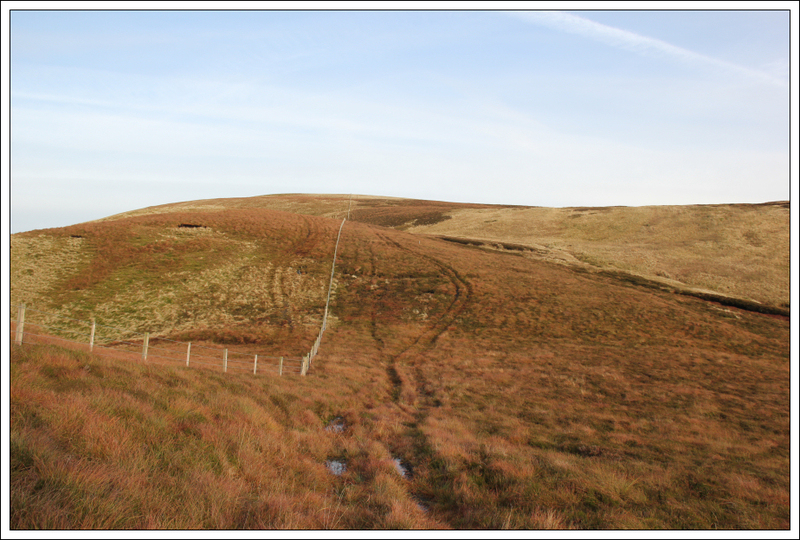 To gain access to the hillside, I climbed over a fence a short distance up the track leading to Cramalt. This would be the first of many fences to clamber over today. 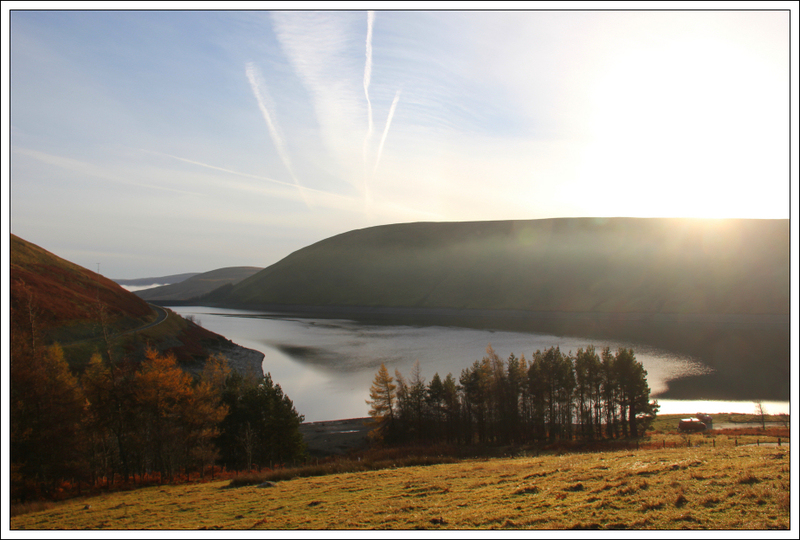 Within five or ten minutes of setting off, I was already being treated to fine views down to the Megget Reservoir. On reaching a barbed-wire fence, I followed the fence to its end where it was possible to climb over a wooden gate instead of rusty barbed-wire. 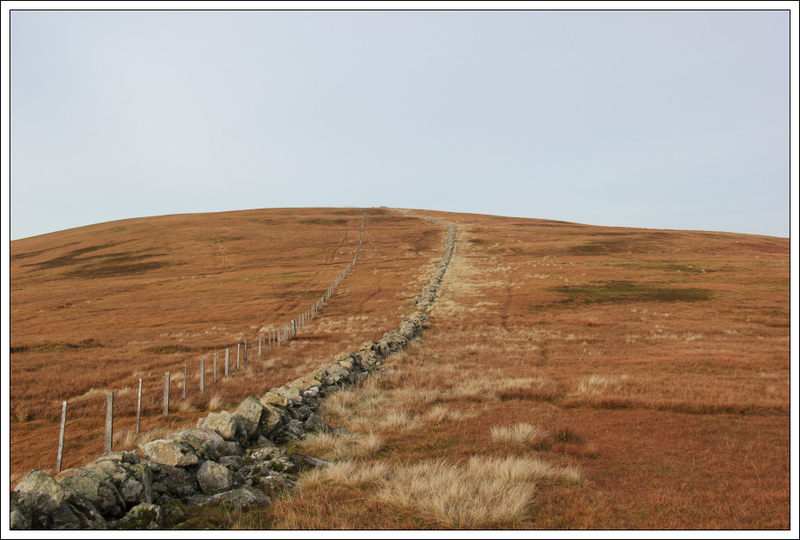 I then followed a vehicle track as far as it helped me progress towards the summit of Clockmore. 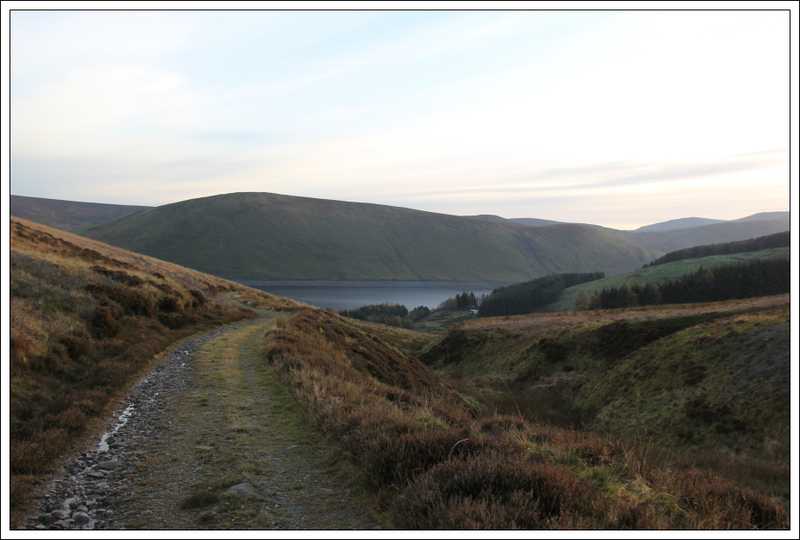 The final hundred or so metres of ascent was up trackless terrain. I reached the summit of Clockmore circa 45 minutes after setting off from the car. Clockmore is a New Donald but is not a Donald. It was nice to look across to Broad Law. I ascending Broad Law back in 2008 - my first day on the Donalds. Somehow I managed to miss the track descending from Clockmore towards Pykestone Knowe. After a fair bit of heather-bashing and hag-avoidance, I managed to get myself onto the track. The track was fairly wet underfoot as you can see from the next photo. 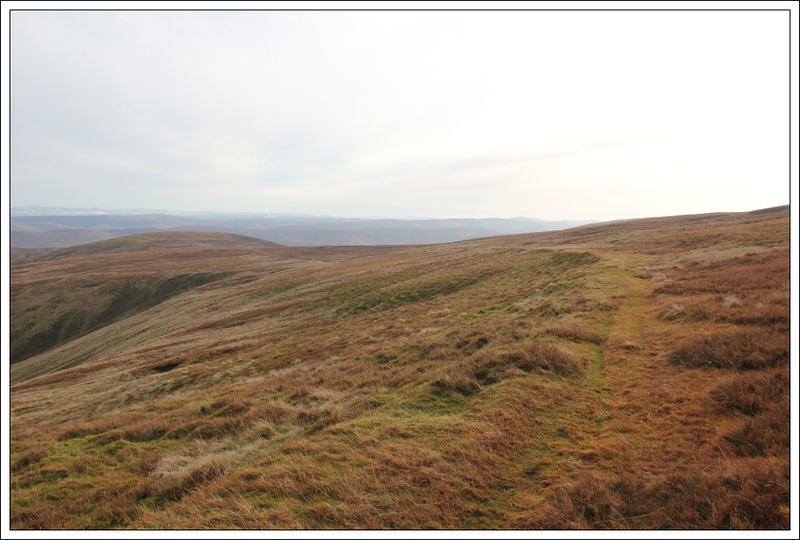 After ascending Pykestone Knowe I continued to follow the track towards Cramalt Craig. 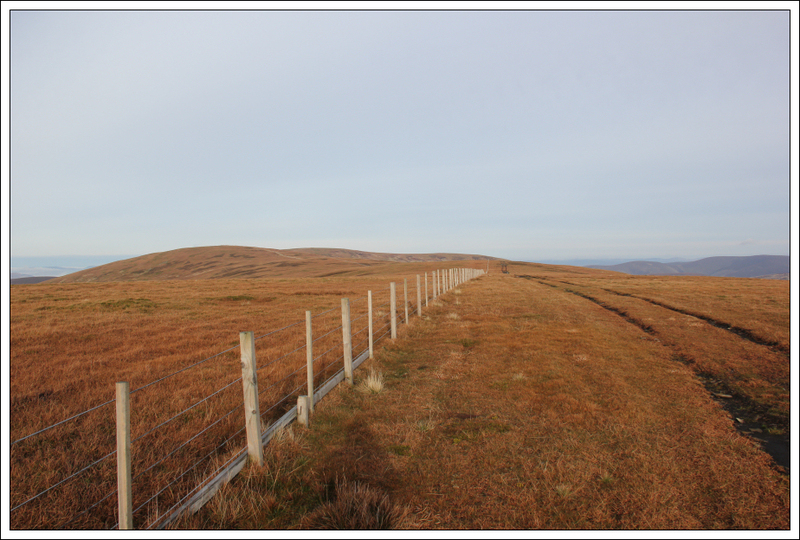 By following the track, I lost more height than I needed to however by following the track I did manage to avoid having to cross through an area of peat hags. The ascent of Cramalt Craig was straight-forward, mostly up short, dry grass. It was nice to see lots of inversion down below. I decided to take some photos into the sun hoping to avoid lens flare. I switched the camera to manual and set the exposure to 1/4000 to stop the photo from being mega-bright. 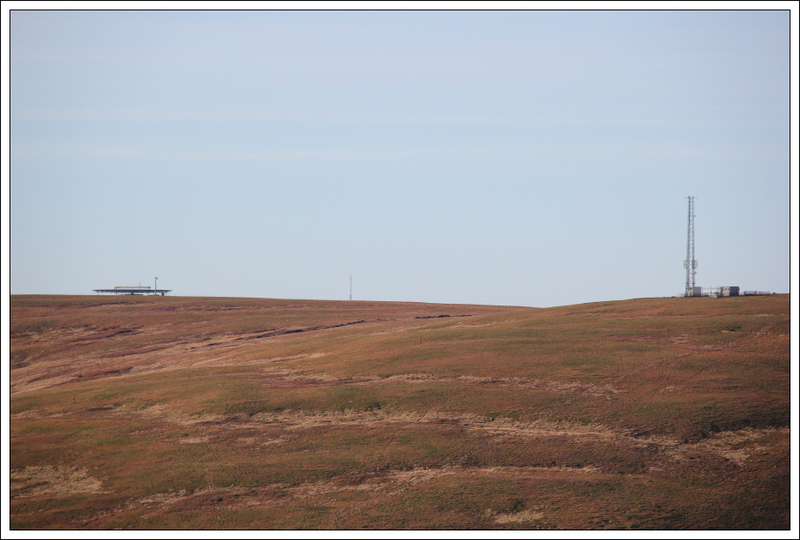 During the final ascent of Cramalt Craig, I stopped to take a zoomed-in photo of the radar and transmitter at the summit of Broad Law. 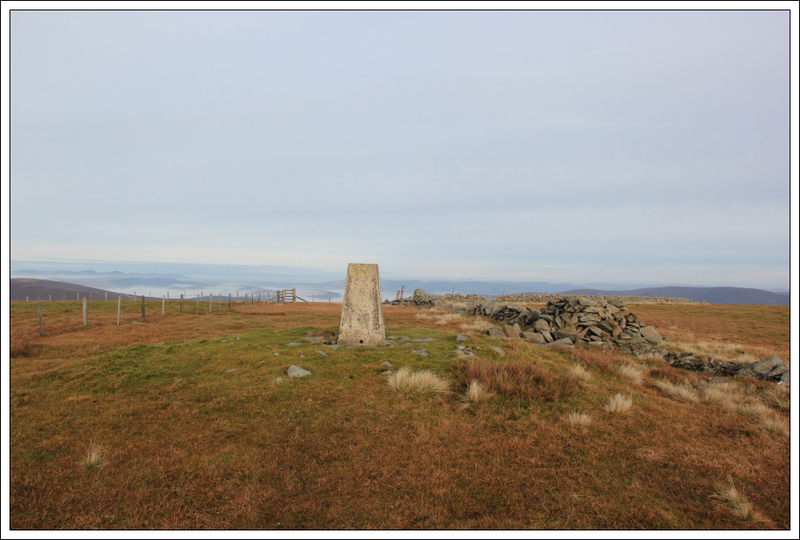 It was nice to reach the summit of Cramalt Craig, the highest point of the day. Cramalt Craig used to be a Corbett but was demoted when it was found to not have a 150m drop all round. The drop is apparently only 147.4m! Cramalt Craig is therefore now a Corbett Top as well as a Donald, New Donald and HuMP! 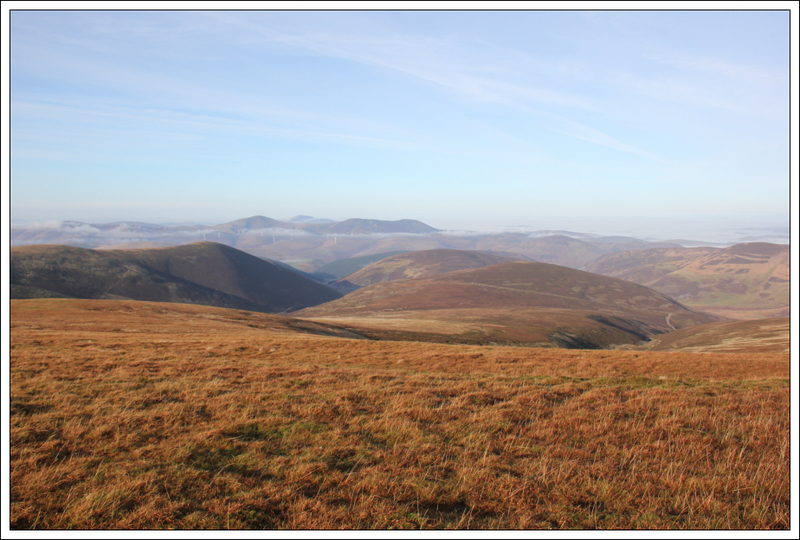 While at the summit of Cramalt Craig, I took a photo of a group of hills in the distance that I believe to be the Eildons. 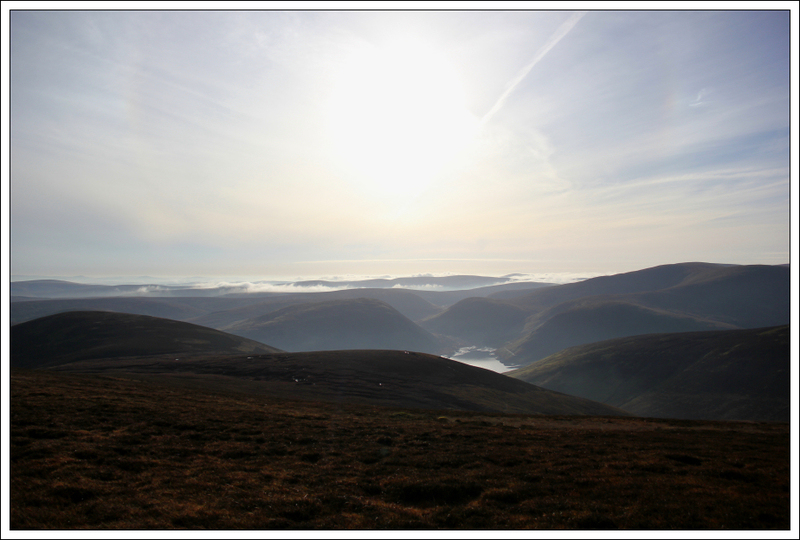 From Cramalt Craig, I decided to head out to Hunt Law. This would involve an out and back with a 240m drop. From several kilometres away I could see a big wide track running across Hunt Law. 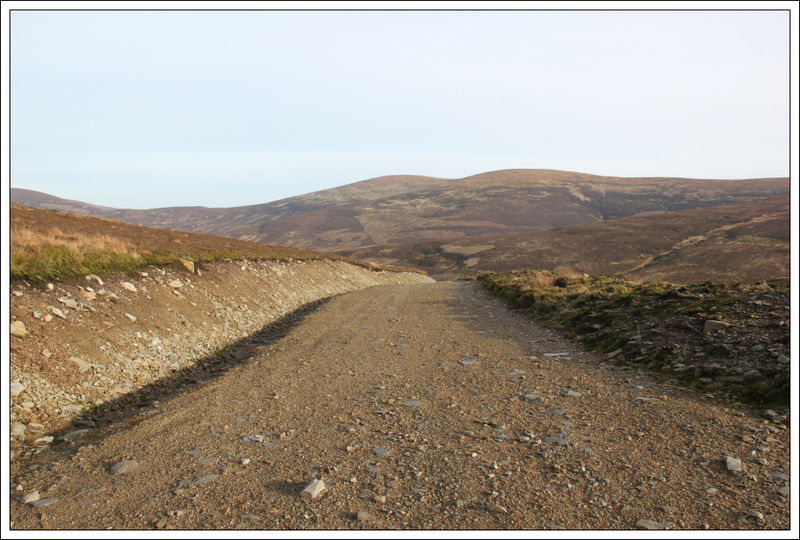 My guess is the landowner is a d**k (a bit like the one at Achnasheen). If building a track don't just bulldoze your way across the hill leaving massive piles of earth at the side. 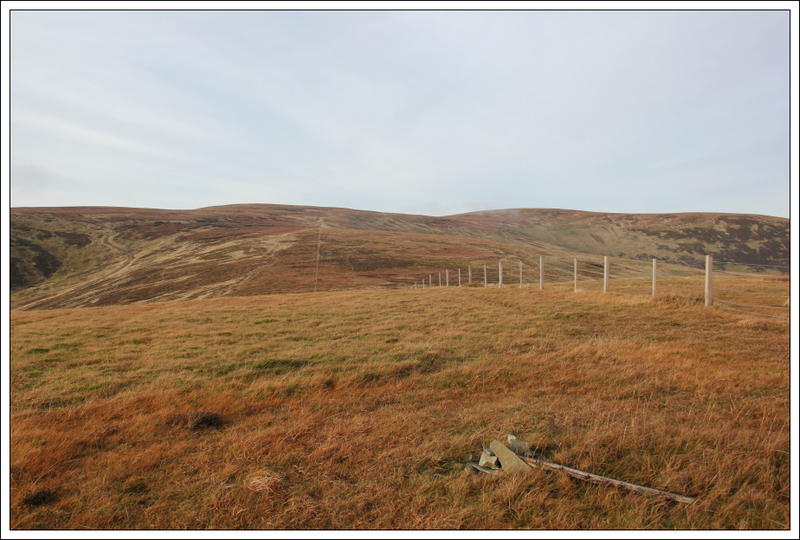 My guess is this track has been put in by the landowner with a view to trying to get a windfarm built on this hill! 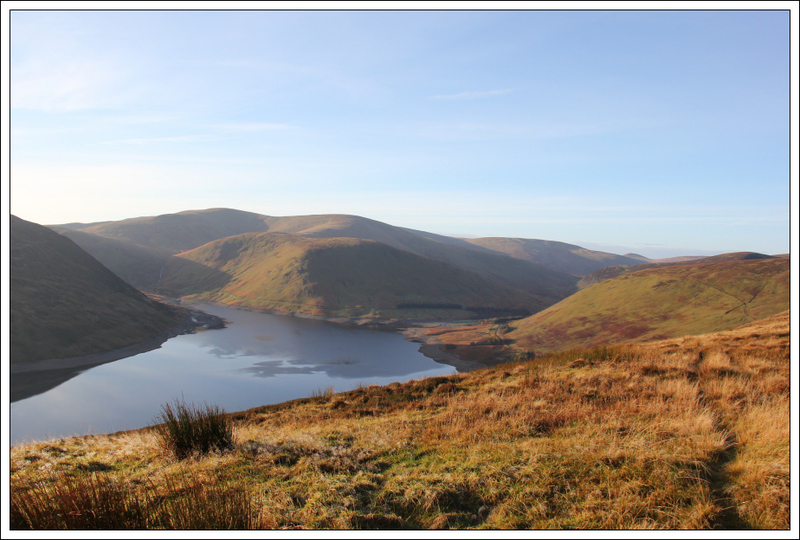 The ascent of Hunt Law was very easy. The summit is featureless. Hunt Law is a New Donald but not a Donald. 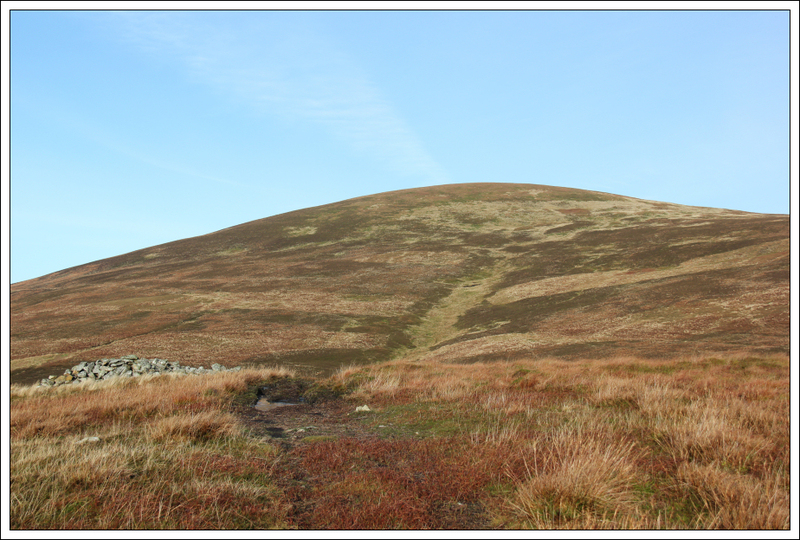 From Hunt Law, I made my way back towards Cramalt Craig but instead of ascending all the way back to the summit I skirted towards Dun Law thus avoiding circa 80m of ascent. 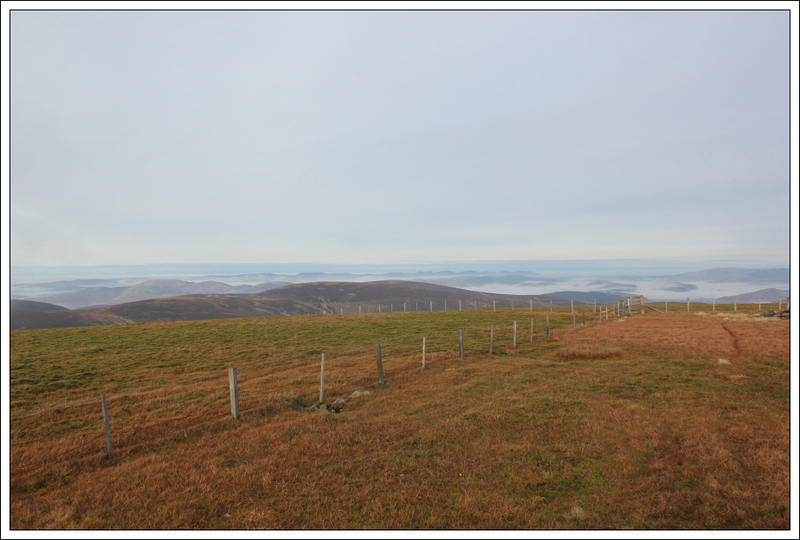 As I progressed along the track leading to Dun Law, Fifescar Knowe and Dollar Law, I got outstanding views towards the Southern Highlands with a wide expanse of inversion in between. My photo unfortunately doesn't show how awesome a site this was. Fifescar Knowe is a Donald Top, not that I am doing Donald Tops! 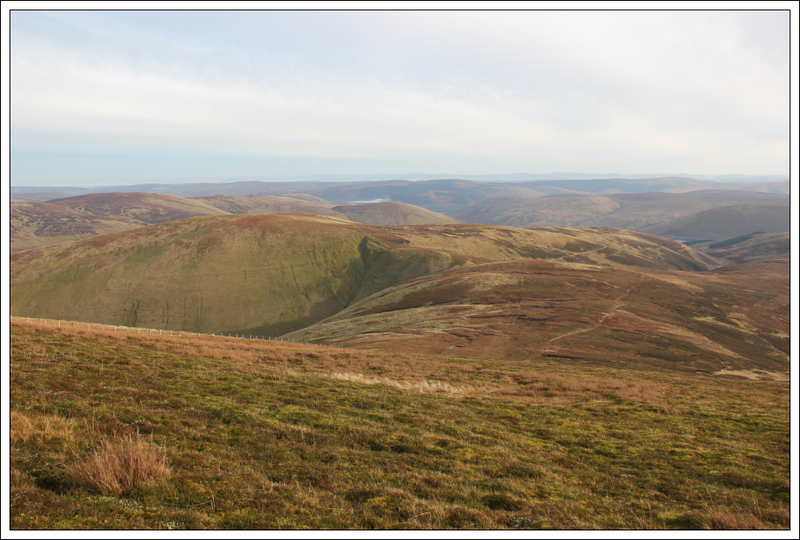 I eventually reached the summit of Dollar Law which is a Corbett Top, New Donald and Donald. On looking at the map I could see that I had a fair distance to walk to get back to the car. 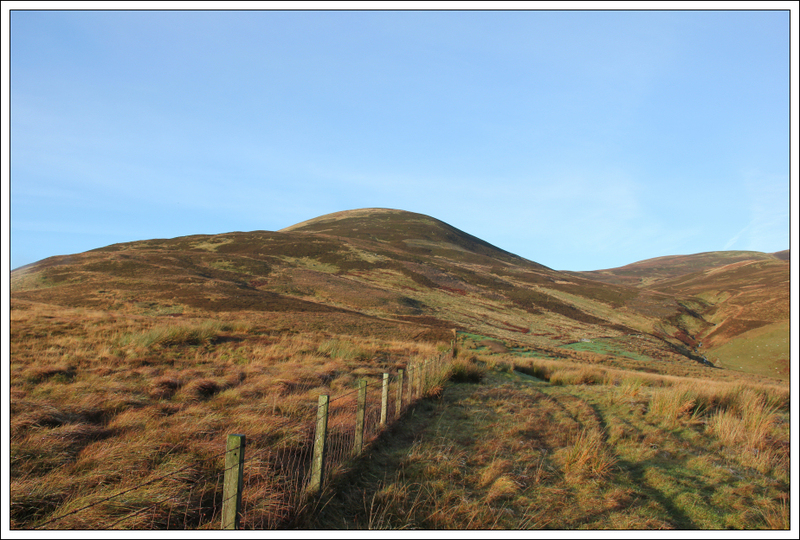 From Dollar Law, I returned several hundred metres back towards Fifescar Knowe before following the Thief's Road out towards Notman Law and Greenside Law which would hopefully be my fifth and final New Donald of the day. The Thief's Road was good in places and bad in places - a real mix of terrain. I opted to leave the Thief's Road to also ascend Notman Law. Notman Law is a Donald Top. Honest I am not doing the Tops! 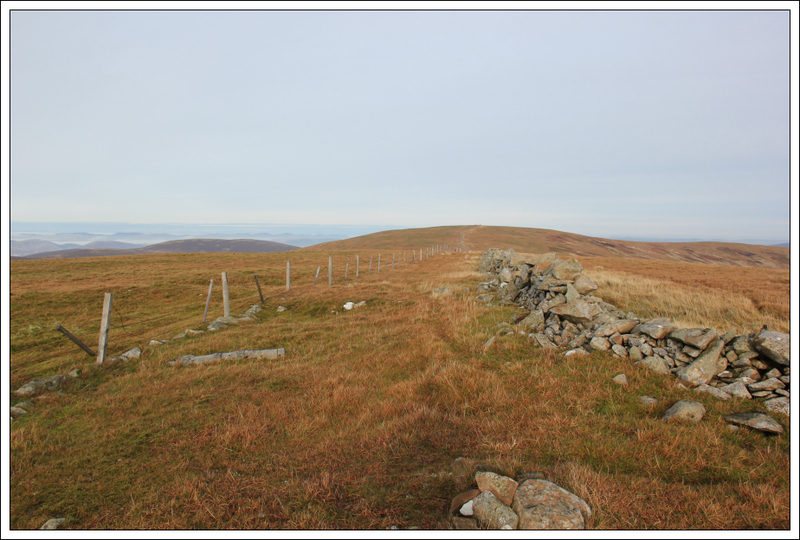 From Notman Law, I made my way down and across towards Shielhope Head. 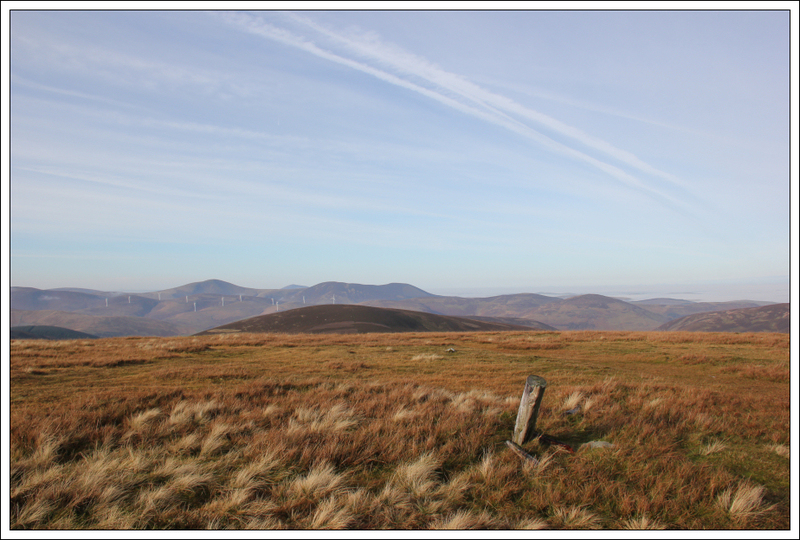 I skirted the top of Sheilhope Head and then began my ascent of Greenside Law. 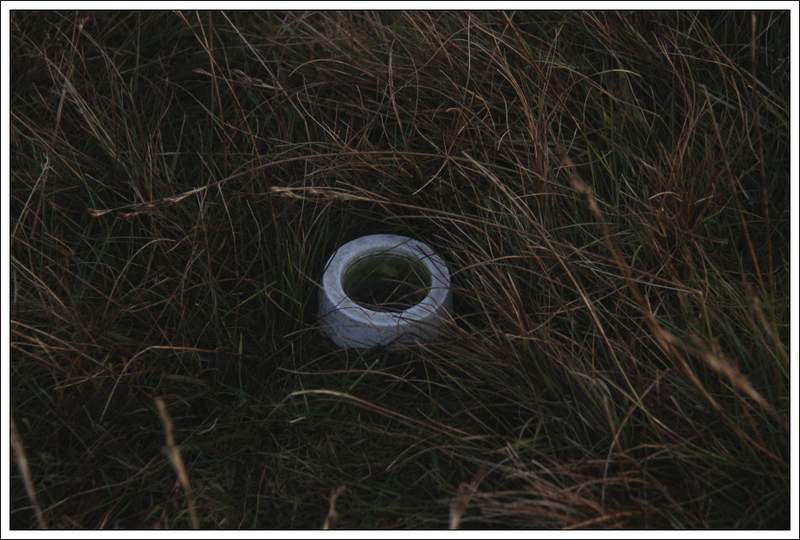 At the summit of Greenside Law there is a white marker stuck into the ground. Greenside Law is a New Donald and Donald. 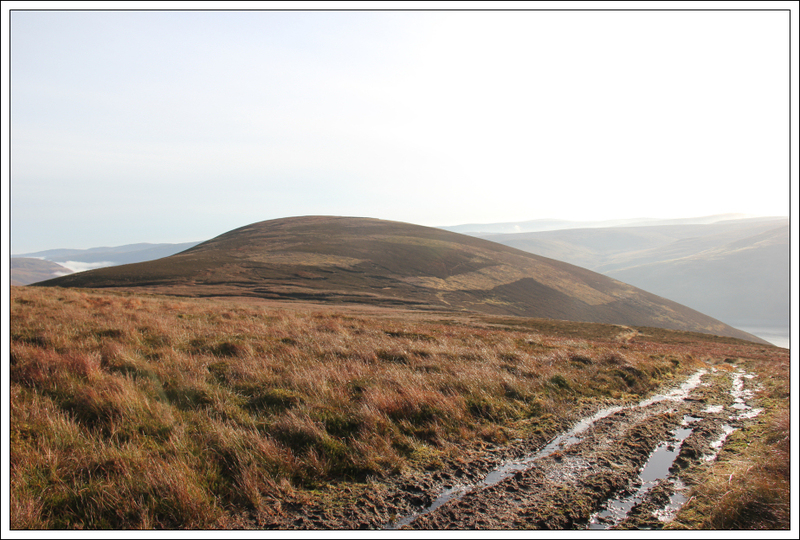 The descent from Greenside Law down to the Manor Head Right of Way track was by far the worst terrain of the day. With every step I sank at least a foot into the ground - lots of wet, deep moss. Once onto the Right of Way, it was an easy walk back out to the car. 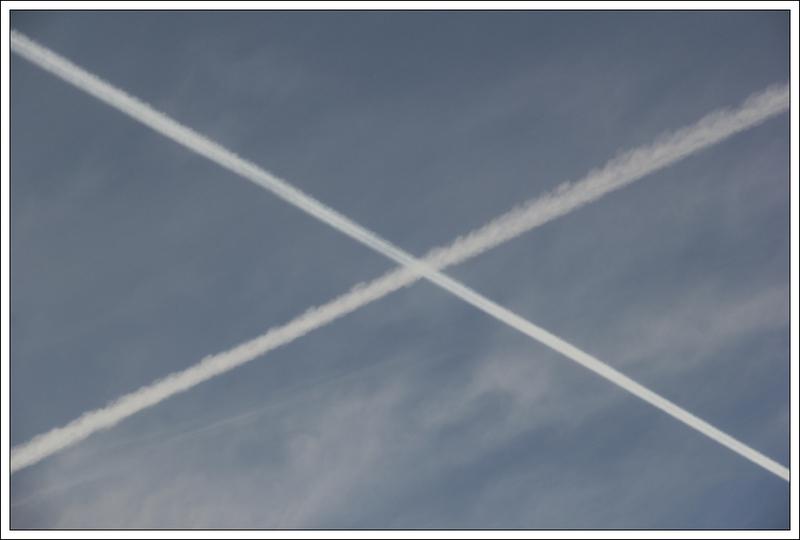 During the walk back along the road, I stopped to photograph a saltire in the sky . 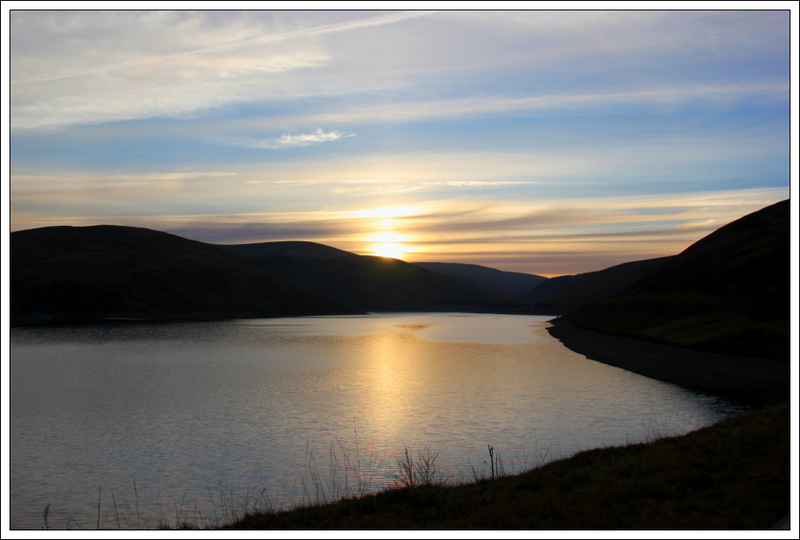 On reaching the car park I was also treated to a nice pre-sunset view across the Megget Reservoir. 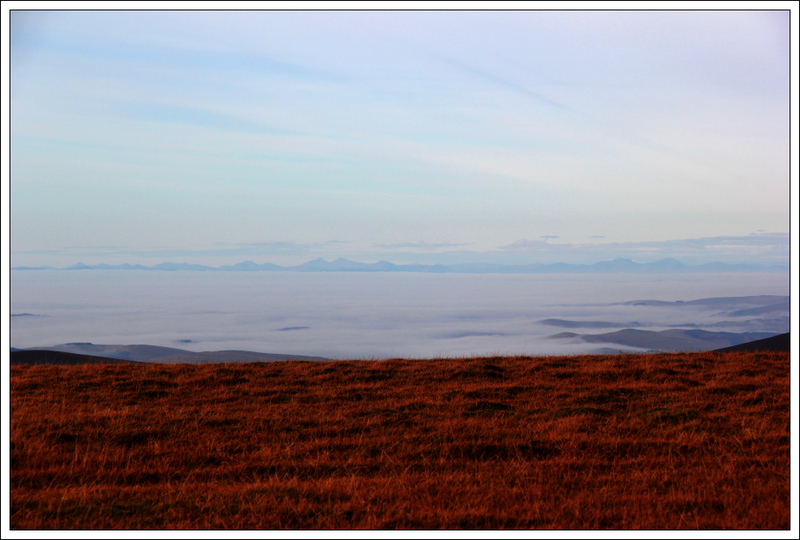 This was a really enjoyable walk with some great views thanks to the inversion. Last edited by foggieclimber on Mon Nov 17, 2014 7:27 am, edited 1 time in total. 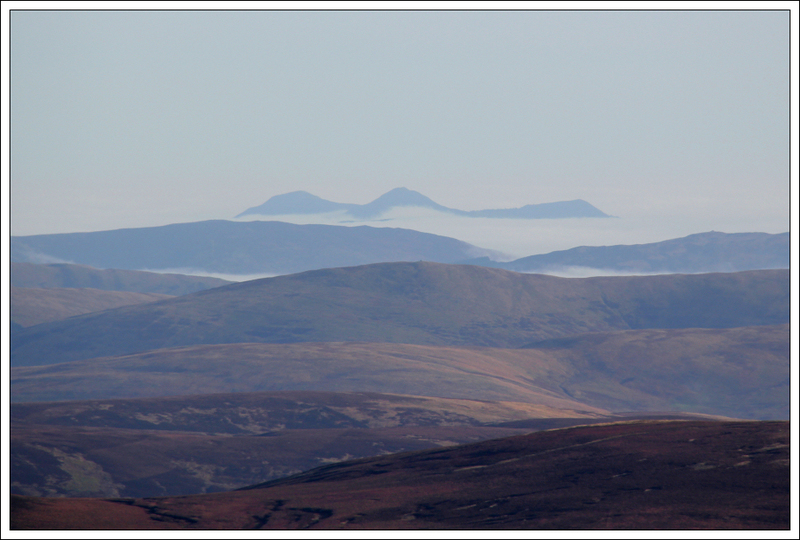 I had much that same Southern highlands across a sea of cloud view from Scald Law in the Pentlands - except that I suppose you had the Pentlands sticking up in between! Best view for me was towards the south or south west, with various hills doing Nessie impressions - amazing, but too much into the sun for good photos. You post some fantastic walks Foggieclimber, I shall be looking through your archives for ideas to steal for the future. well done foggy looks like u had a good day for it, not many donalds left now, was up at loch carron walking at the weekend met somebody from dingwall late sixties whos walked with you before,cant remenmber his name now. robertphillips wrote: well done foggy looks like u had a good day for it, not many donalds left now, was up at loch carron walking at the weekend met somebody from dingwall late sixties whos walked with you before,cant remenmber his name now. Thanks Robert. 3 remaining New Donalds. 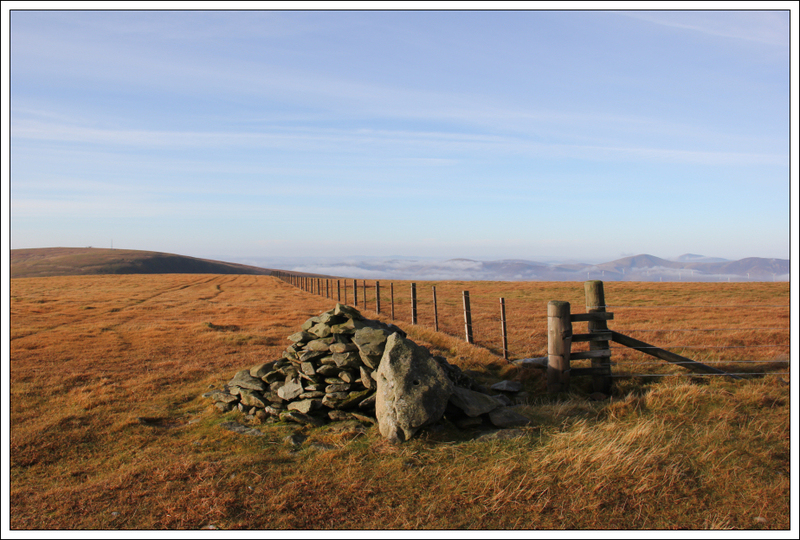 I think the chap from Dingwall would be Jim B.
beaner001 wrote: You post some fantastic walks Foggieclimber, I shall be looking through your archives for ideas to steal for the future. I wasn't far up the road having a slightly easier day than yourself. 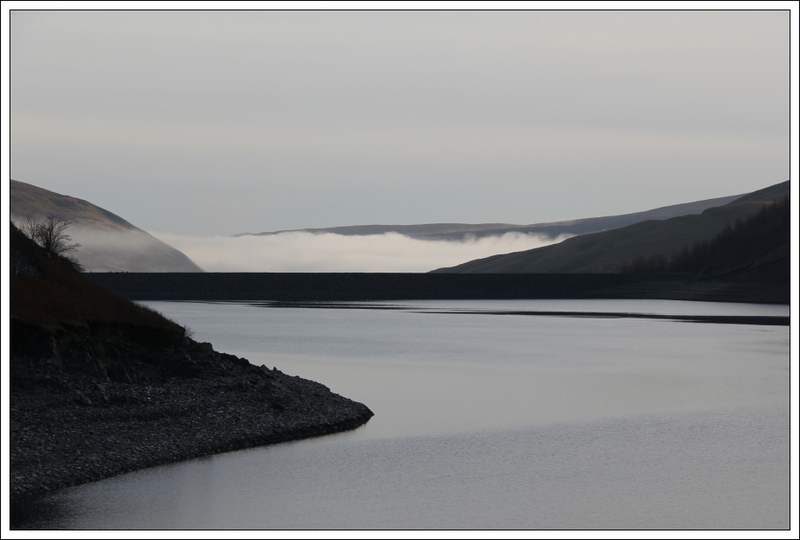 The low cloud made for some good photos. Looks a good route, was looking at something similar for the Donalds i have left here, cheers.